DEEP LIFE DESIGN – HOW TO DESIGN A WONDERFUL LIFE ? DEVELOP A SPARKLING LIFE PLAN. SET CLEAR GOALS, TO TRANSFORM YOUR PRIVATE LIFE AND CAREER. LESS IS MORE: LEARN HOW TO CREATE MORE TIME AND SPEND IT BETTER. LEARN ABOUT CREATIVE IMPLEMENTATION TECHNIQUES, FOR DIRECT RESULTS. REALIZE YOUR NEW AMBITIONS WITH MORE JOY AND ENERGIZED FOCUS. THERE ARE 10 ONLINE WORKSHOPS. EACH ONE CONTAINS A SHORT VIDEO AND TEMPLATE, INVITING YOU TO DO A SMALL CREATIVE EXERCISE. YOU DON’T NEED TO BE A DESIGNER. EVERYONE CAN DO IT. YOU’LL BE GUIDED STEP-BY-STEP. YOU CAN START NOW AND BOOK FAST RESULTS. WATCH THIS RADIO INTERVIEW AT EENVANDAAG. A NEW YOU, ME AND.....WE! “THE LAST 2 YEARS IT FELT THAT WE WERE LIVING TWO SEPARATE LIVES. THERE ARE 10 ONLINE WORKSHOPS, WHICH YOU CAN DO AT HOME OR WHEREVER YOU WANT. THE WORKSHOPS ARE INCLUDING VIDEOS, TEMPLATES, TIPS AND TRICKS. YOU DON’T NEED TO BE A DESIGNER. EVERYONE CAN DO IT. DEEP LIFE DESIGN IS A TESTED METHODOLOGY. WE OFFER MONEY-BACK SATISFACTION GUARANTEE. 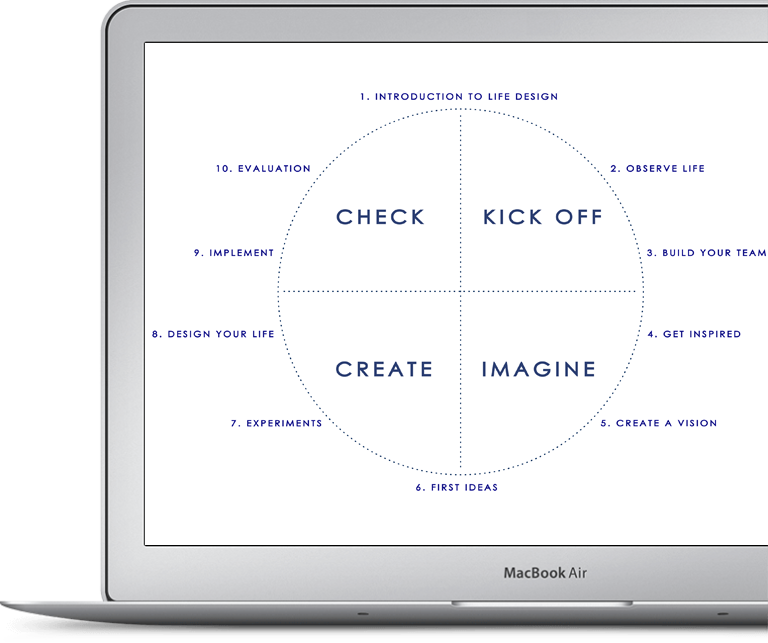 INTERESTED IN DESIGNING YOUR LIFE? HERE IS 1 SHORT WORKSHOP, SO YOU CAN SEE IF YOU LIKE IT.